Welcome to OrthoLA. 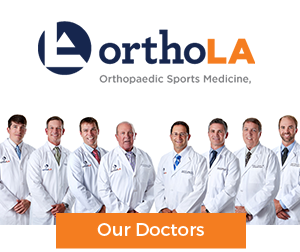 With seven of the leading orthopaedic surgeons in Louisiana on staff, our orthopaedic center focuses on a wide range of conditions and injuries. OrthoLA has the ONLY board certified fellowship trained orthopaedic surgeons in the region, specializing in Hand and Elbow, Shoulder, Knee, Hip, Ankle, and Foot conditions. OrthoLA is committed to excellence by pledging to provide the highest quality of orthopaedic care. OrthoLA specializes in treating individuals and athletes of all ages with musculoskeletal injuries that affect their ability to function in the workplace or on the playing field. Your health and comfort are our first priority. Along with high quality of care, we strive to provide you with the personal attention you desire. Our goal is to make your visit to our office as comfortable and convenient as possible.